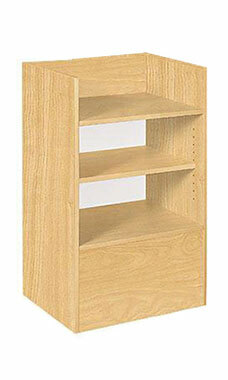 Complete the display presentation within your store using our Economy Maple Well Top Register Stand. Fully assembled, the register stand will hold the computer or cash register that allows your business to function. Additionally, the stand features an adjustable rear storage shelf, which comes in handy when employees need to store personal goods, or when you need a place to stock tools, accessories, or supplies. The low pressure melamine maple laminate finish matches our entire selection of maple display cases. Overall dimensions measure 38"H x 18"D x 24"L. Crating for secure shipping is included in the price of the case. Fully assembled and ready to ship.